We are going to be on the Detroit Channel 7 news today November 1st , during the 4pm newscast (The Now). JoAnne Purtan, an Emmy Award winning anchor & reporter, was kind enough to feature me on her Mom’s a Genius segment. The segment will re-air the following morning, Thursday November 2nd, on TV 20 between 8 & 9 am and I will be live on the news talking about Pancake Presents! I am so excited and delighted by this opportunity! Please tune in or set your DVR! I will update with links to the story after they air and become available. I also wanted to announce that our pancake molds will be available for purchase at Basket Kreations, 550 Forest Ave, Plymouth, MI 48170. They are inside the Westchester Square Mall near Maya’s Deli. 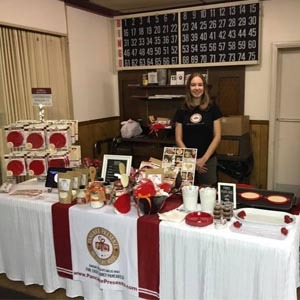 This is an awesome store with great gift baskets and unique Michigan made products! Stop in and check it out and pick up a pancake mold while you are there! There are a few upcoming events I would love for everyone to check out as well! We will be at the Rochester High School Holiday Bazaar (180 South Livernois Road, Rochester Hills, MI 48307) this Saturday November 4th from 10am-3pm. There will be TONS of local crafters, artists and vendors, so stop by and visit us at our booth! You can purchase tickets on eventbrite.com or at the door. If you book online you get early access at 9am and are entered in to special prize drawings. Our next show after that will be Santa’s Workshop Craft and Vendor Show, Saturday November 11th 10am to 3pm at the Quality Inn and Suites at 7076 Highland Rd Waterford 48328. Santa will be here so bring the kids! Thanks for the support, and a special thank you to the Channel 7 news team and JoAnne and John!